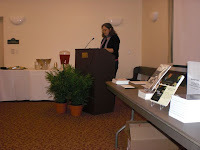 As evidenced by Sherrie Flick's flash fiction lecture at Salem College in North Carolina last Wednesday. Note the prominently displayed Field Guide on the table to Sherrie's left. Note also that Sherrie's novel Reconsidering Happiness is available for purchase from University of Nebraska Press. Consider purchasing a copy of both books. Thanks, Sherrie!